As the summer slowly disappears, the trees will slowly start to turn into beautiful colours and Cercidiphyllum japonica is one of the first ones to turn. It won’t be the colour that gets you interested in this plant but the smell! Oh boy how good does this plant smell! It’s like a sweet toffee apple or burnt sugar. The smell is just out of this world! It comes from a chemical called Maltol. Maltol is a natural occurring compound that is more commonly used as a flavour enhancer within the food industry. The smell does give us its common names of weeping Toffee apple tree and burnt sugar. 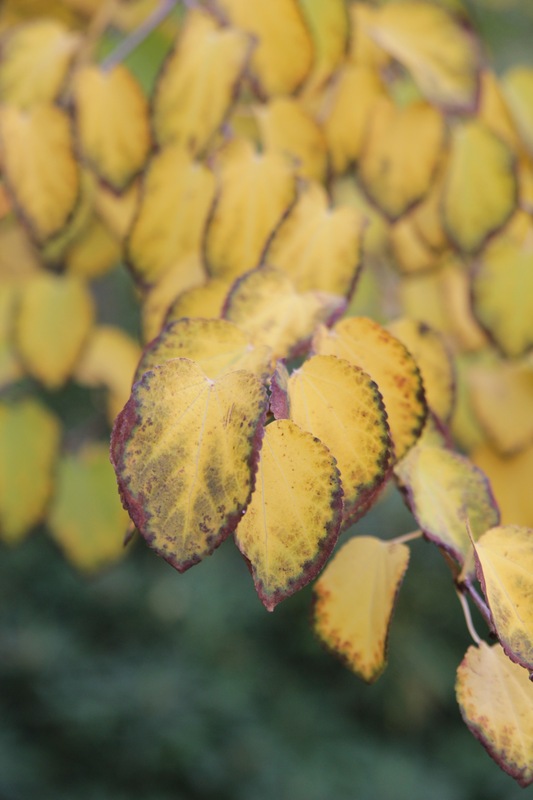 In its native home of Japan, it is called Katsura tree, roughly translated means Japanese Judus tree, the leaves of the tree do indeed look like a small versions of the Judus tree. The leaves come out mid spring and have lovely bronze/green with red lines in them when they first come out. These darken to a medium colour green before turning great shades of orange, pink or yellow in the autumn. It does have flowers that appear in April and May but are pretty small and not that noticeable. The rarely seen weeping form makes a small to medium size tree in most gardens although given time (200yrs+)and space, it will become a big tree. This form is thought to originated in a monastery in Japan on the small island, Northern Honshu. It is indeed from this form that all the Cercidiphyllum japonica f.pendulum being grown in the world, come from this one plant. Ideally this beautiful tree needs to be grown in a sheltered spot in the garden in a nice sunny or semi shade spot. Soil wise it’s best in a good moisture retentive soil that is slightly acidic. It will grow in neutral to slightly alkaline soil but sadly the autumn isn’t as good. It is normally is pestfree thankfully!